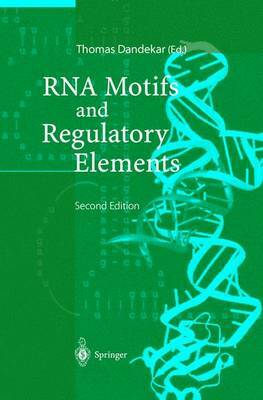 RNA Motifs and Regulatory Elements is the new edition of the successful book, "Regulatory RNA". It alerts the reader to the importance of regulatory RNA elements for the many different areas of cellular life. The computational and experimental methods and tools to search for new interesting regulatory RNA structures are explained and compared. The knowledge on regulatory RNA structures and elements already available is concisely summarized as well as catalogued. In addition, interesting RNA elements are analyzed in detail regarding their dynamics, regulation, and as a dominant topic of current resarch in molecular biology, including areas such as RNA mediated regulation of gene-expression, DNA/RNA chip data, and ribozymes, splicing, or telomerases in aging. Medical implications are also covered. Future progress and research are finally outlined.